The Autobots unite with Titan Master partners to power up for battle! The gravity disruptors of Xort give Highbrow the power to manipulate gravitational fields. I'll be honest. I wasn't sure what to expect when Hasbro announced the Titans Return line. Since the first wave of figures they revealed contained so many non-Headmaster characters, I wasn't sure how many of the traditional group we'd get. I had my hopes up for some more than others, though. Scorponok, Apeface, Squeezeplay and Nightbeat have all been either entirely absent or demoted to pocket money figures, but Skullcruncher, Chromedome and (of course, since he's the subject of this review) Highbrow are all present in their full glory. And out of those, I think Highbrow was the one I was hoping for the most. His colours, vehicle mode, head design and robot layout have always struck me as very eye-catching, quite possibly the nicest-looking of the 1980s Headmasters in both toy and media form. My level of excitement was so high that he became the first currently-at-retail figure I ever bought at a convention just to save myself from having to wait a few more weeks for him to show up in stores. But did the figure match my lofty expectations? Initially, to be honest, I found it a bit disappointing. But after sitting down to review it, now I'm not so sure. 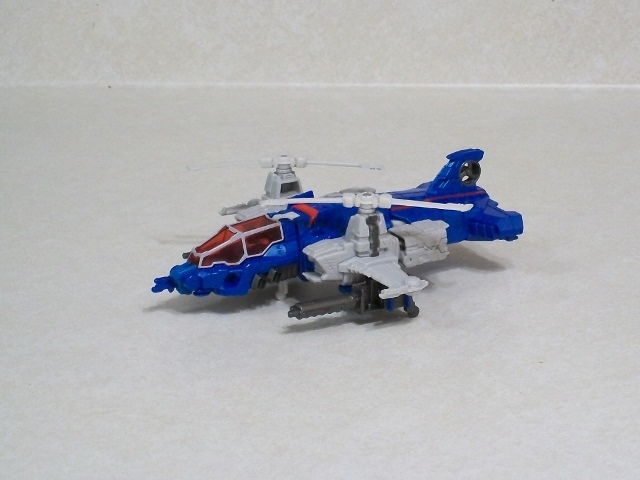 Alternate Mode: Much like his 80s incarnation, Highbrow turns into a twin-rotor helicopter of alien design. I'm not entirely sure that something with such a configuration could actually fly, at least in our atmosphere, but it looks cool and that's way more important. His coloration is also pretty similar to the original, medium, sparkly blue and light grey with some red and dark grey highlights, and a transparent red cockpit canopy. His play features (and stop me if you've heard this before) haven't changed much from the 80s either. His twin machine guns peg in under his wings, his canopy opens for Xort to hang out in, and his rotors spin. I've always loved the look of Highbrow's alternate mode, so you can colour me very happy that it's replicated so closely here. The proportions are a bit wonky -- the tail section is pretty fat, his robot mode waist doesn't hide all that well and his vertical stabilizer should probably be longer -- but overall it's far more detailed and mechanical-looking than the 80s toy. It's a trade-off, but I find that I like the new one a bit better. Highbrow isn't without flaws, though. His rotors are probably the biggest one. They look pretty puny, but at the same time they're big enough that they'll hit one another if you spin them both at the same time. So if you're the type to swoosh your Transformers around in alt-mode while spinning their rotors, that's going to frustrate you. 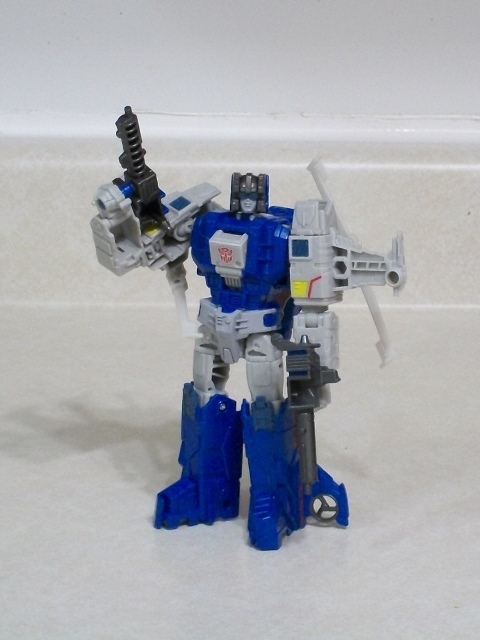 The other problem is line-specific: he doesn't seem to have any Titan Master foot pegs in alt-mode, which limits the cross-play possibilities with other Titans Return figures. He does have a bunch of 5mm sockets though, so he can at least mount them in weapon mode. Overall, I think Highbrow is a very solid futuristic vehicle, very eye-catching and fairly unique in the TF universe as well. Robot Mode: Before I sat down to review him, I would have said that Highbrow's robot mode was his weak point. After playing with it a bit and taking pictures, though, I'm not convinced. As with the alternate mode, this is basically the 1980s toy with joints and detailing added. From the neck down, anyway -- Highbrow's head is based on his animation/comic book character model, which is for the best. In fact, I'd say that Highbrow's angular, blocky head may actually be his best feature. 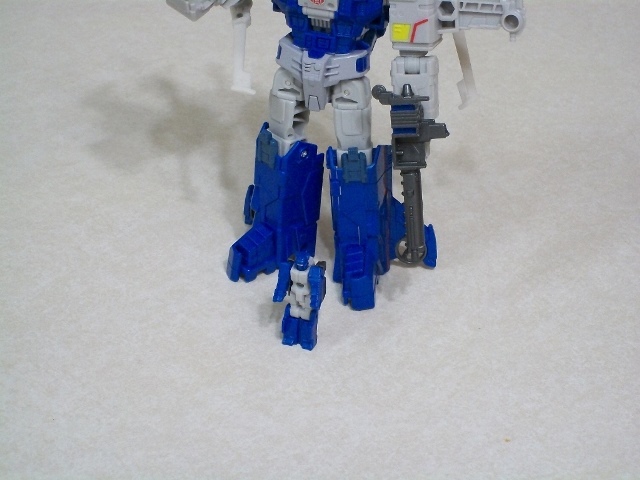 As with robot mode, we're looking at a figure that's mostly blue and grey, with some red and now yellow to add details. I want to say that he's a gorgeous figure, but there's one very obvious flaw. Highbrow is very hollow. That's not new -- most modern Transformers have some pretty obvious hollow parts. But Highbrow's are more noticeable than most. What part of his arms weren't already hollow due to the transformation seem to have been scooped out to save weight. His lower legs are also entirely hollow at the rear, which is unfortunate because if the light strikes just right you can actually see right through them along the seam between the inside and outside halves. I'm not of the opinion that it ruins the figure, like some are, but it does call for a bit of careful posing to minimize how many of the hollows are on display. 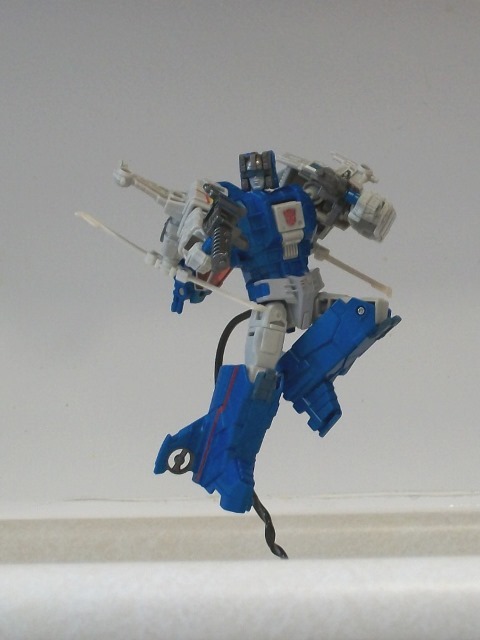 Highbrow does pretty well on the articulation front, though. But before reviewing him, I didn't think he did. His jointing scheme is a bit...awkward, I guess? He feels deceptively stiff, as if he shouldn't be able to do much, but after I got used to how his shoulders were set up I found that he could actually move them as well as the best Deluxes in the line. And his legs show off one of the benefits of having so much hollowness: he has great range in his knees because there's nothing to keep them from bending well past the standard 90 degrees. His neck is on the standard ball joint, his wrists can "roll" a fair bit to either side, he's got the standard 90 degree elbows, and a set of bicep and thigh swivels complete the set. All in all I think he's one of the most poseable of my Titans Return figures, and most importantly he looks good in any pose you put him in. You will hear complaints about his rotors getting in the way of arm movement, and there's truth to that, but it's easy enough to work around if you're careful. 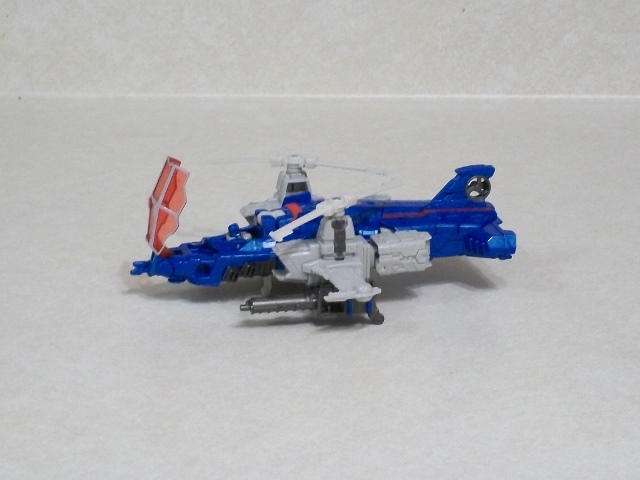 Highbrow comes with two accessories, a pair of machine gun-looking things that can combine together into a seat for Xort or any other Titan Master to ride around in. Honestly I don't think any of these combined weapons have worked well for their intended purpose, but it's a neat feature to have and I definitely prefer this to the obvious TM chairs with guns strapped on that Chromedome, Astrotrain or Weirdwolf tote around. But then there's the elephant in the room: Highbrow is a bobblehead. He (and remold-brother Scourge too) both feature a badly-designed Titan Master socket that simply doesn't lock their partners in place properly. Xort will flop forward and back quite easily, making it a bit awkward to pose his neck. Like the hollowness, there's actually a hidden up-side here: Highbrow is the only TR figure I own that can look up or down more than a degree or two. He's not supposed to, and he'll do it when you don't want him to, but you've got to look for the silver lining on the cloud, right? Overall, Highbrow has a lot of flaws in robot mode but I like him a lot more than I expected to. Titan Master: Who the hell trademarks "Gort", anyway? It's amazing how many of the mostly-meaningless Nubulan names from the 1980s Hasbro couldn't use this time around. Although Titan Masters are to some degree a fungible commodity, "Xort" is actually one if the nicer ones. He's cast in the same really nice sparkly blue and grey as Highbrow and has a painted visor that (on mine anyway) was applied cleanly, which definitely makes him stand out from the crowd of otherwise fairly plain little guys. His head mode is, as I mentioned above, pretty fantastic. The dark grey helmet, light grey face and big blue visor give him a classically heroic look, and the fact that his face mold is basically a big square means that you don't have to worry about the Titan Master's arms sticking out beyond the borders of his face like a set of unwanted horns. His colours are a nice fit with a wide range of other Titans Returns figures, too.